Only 8 SE models left in stock! New vehicle pricing includes all offers and incentives. Tax, Title and Tags not included in vehicle prices shown and must be paid by the purchaser. While great effort is made to ensure the accuracy of the information on this site, errors do occur so please verify information with a customer service rep. This is easily done by calling us at (505) 797-3600 or by visiting us at the dealership. 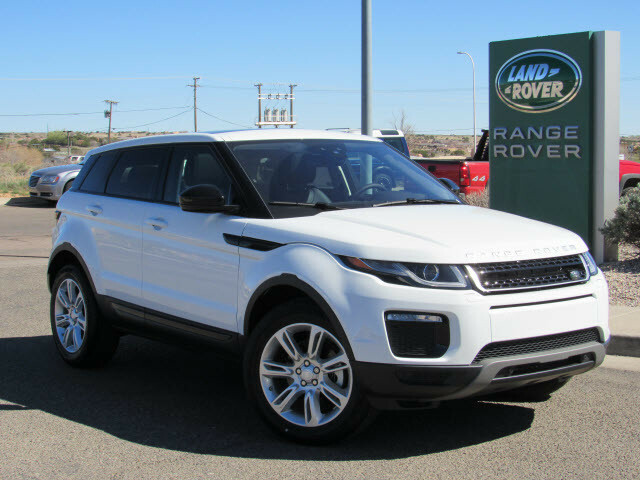 Contact Land Rover Santa Fe today for information on dozens of vehicles like this 2019 Land Rover Range Rover Evoque SE. Want more room? Want more style? This Land Rover Range Rover Evoque is the vehicle for you. There's a level of quality and refinement in this Land Rover Range Rover Evoque that you won't find in your average vehicle. Tackle any terrain with this 4WD Land Rover Range Rover Evoque SE. Off the road or on the parkway, you'll drive with confidence no matter the weather conditions or landscape. You can finally stop searching... You've found the one you've been looking for. We treat the needs of each individual customer with paramount concern. We know that you have high expectations, and as a car dealer we enjoy the challenge of meeting and exceeding those standards each and every time. Allow us to demonstrate our commitment to excellence! Our experienced sales staff is eager to share its knowledge and enthusiasm with you. Land Rover Albuquerque	35.1838378, -106.5886568.